Learn to paint your unique Mandala! This class has a focus on colour! 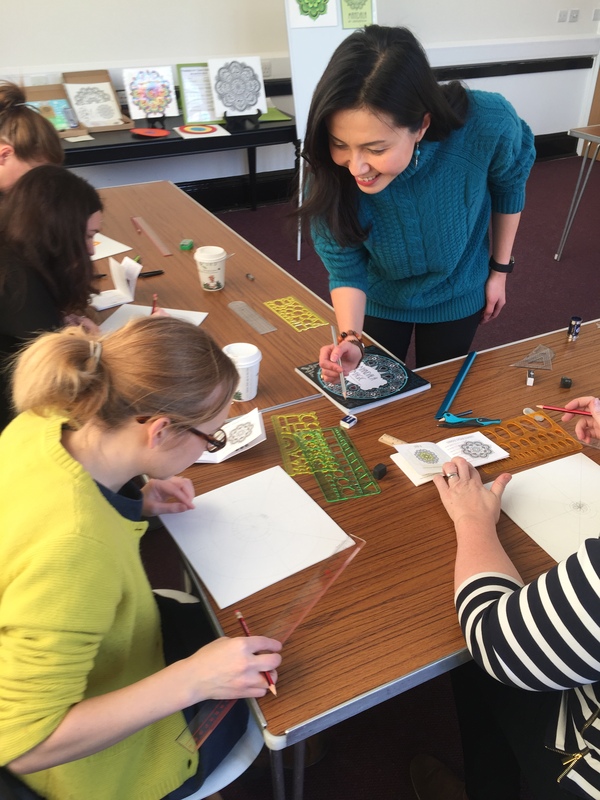 You will learn lots about different media including watercolour pencils, acrylic paints and blending colours for contrast and complement. 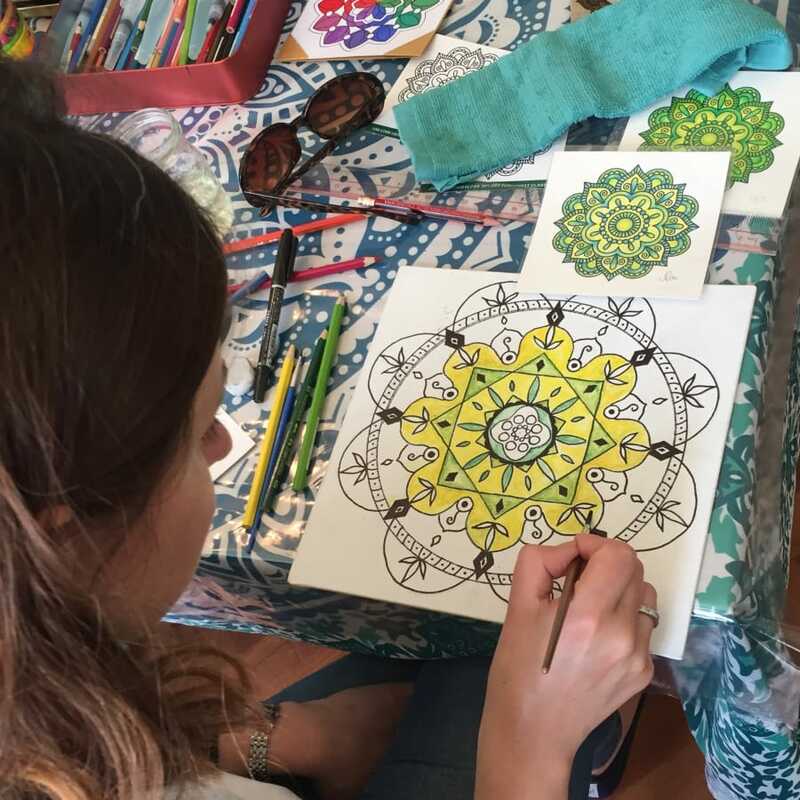 Many of our students do our Mandala drawing class too - but this is not necessary - it works perfectly as a standalone class if you don't fancy drawing but love exploring colours! You will use good quality watercolour pencils or paints and a water brush and learn how to blend and wash colours to create different effects. We will also show you how to use other media. No artistic skill is required. You’ll receive our lovely guidebooks as an aide memoir to help you carry on drawing and painting at home. I bought this course as a gift for my wife, who loves creative stuff whilst we were travelling in London last Summer. I am not usually that bothered about art (terrible at school!) but I surprised myself and really enjoyed it!! Ubie is really sweet and we learned loads about blending colours and using different materials. Next time we are through we are going on the Mandala drawing one which looks amazing! A wonderful fun filled class. So much more than the description. It was amazingly relaxing. Ubie and Matt are very warm, welcoming and kind. The venue is step free and comfortable. I learn the basics of using watercolor pencils, acrilic paint and watercolor. How to combine colours for best effects. All materials were provided. I took home the mandala I completed. I have a sense of achievement and feel great. I highly recommend Ubie as a teacher. She is passionate about sharing her knowledge and helping individuals achieve the effects that they would like too. Ubie is an excellent teacher. Thank you both! Looking forward to enjoying more classes in the future. A friendly and encouraging atmosphere with loads of options for materials to use. Guidance was at just the right level and there was no pressure to rush to finish - the class overran by more than an hour so that we all had time to complete our work. Matt and Ubie are very welcoming and friendly, I will certainly be looking at other classes with Ubie. 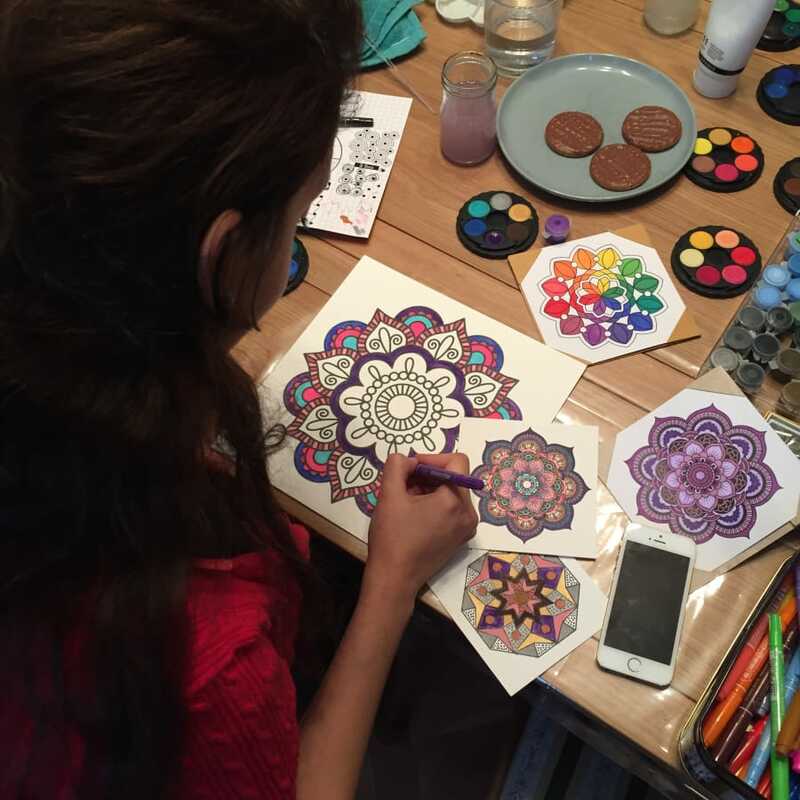 I absolutely loved mandala painting class and will definitely attend future classes. Ubie was very encouraging and friendly. Highly recommended. A very enjoyable and relaxing session with Ubie, she really made us feel at home and there was no expectations on our previous ability or expertise. 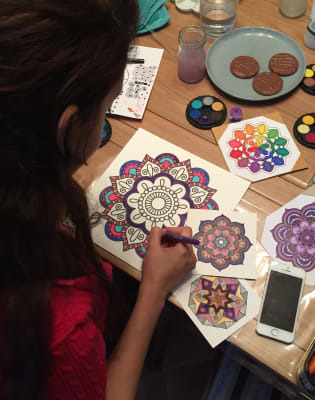 Thoroughly recommend her Mandala class, she is knowledgable and passionate and it was a big bonus that she allowed us extra time to finish our work. We were very satisfied at the end, I definitely surprised myself. The venue is easy to get to and very comfortable environment to work in. This was a birthday present to my wife which I very much enjoyed and benefited from too! I loved the class! it was nice experience and really relaxing, highly recommended, hope to join a different class soon! Thank you Ubie and Matt! Everything is included. This class is 'come as you are'. Whether you have come after a hectic week at work or a busy time watching the kids, we’ll get you in the right mind-set and help you create something beautiful.